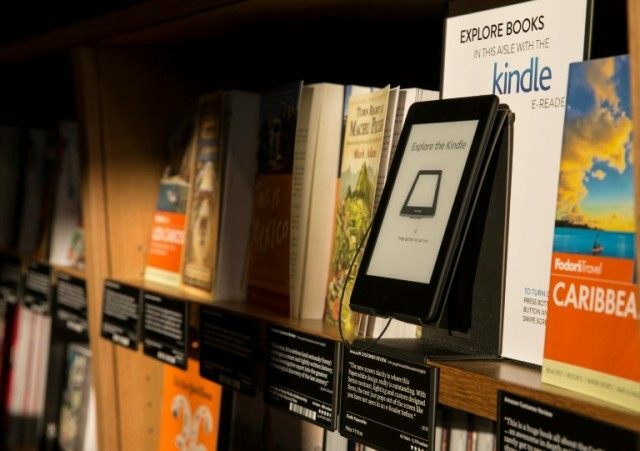 Washington (AFP) – Amazon announced a new high-end Kindle e-reader on Wednesday, aiming to win over readers with a thin, light device despite a trend toward multi-use tablets. The Kindle Oasis, the eighth generation e-reader from Amazon, will be available April 27 starting at $290 for US customers. The Oasis weighs in at just 130 grams (4.6 ounces) and is 3.4 millimeters (0.13 inches) at its thinnest point, or 30 percent thinner on average and over 20 percent lighter than any other Kindle. “To lean back and read for hours, you need a sanctuary from distraction,” said Jeff Bezos, Amazon founder and chief executive. Amazon’s launch comes even as many e-book readers use tablets for electronic books instead of the more limited devices. Amazon has been promoting the e-reader as a more book-like experience with its ergonomic design, long battery life and “Paperwhite” resolution which can be read easily in various lighting conditions. With the new device, Amazon will be selling four e-readers starting at $80, which make it easy to order and read e-books directly from the online retailer.